Colorado's leading airport is the Denver International Airport, which processes about 20 million passenger boardings per year. Other major Colorado airports include the Aspen-Pitkin County Airport, the Colorado Springs Airport, the Durango-La Plata County Airport, the Eagle County Regional Airport, the Fort Collins-Loveland Municipal Airport in Fort Collins/Loveland, the Gunnison-Crested Butte Regional Airport, the Montrose Regional Airport, the Telluride Regional Airport, the Grand Junction Regional Airport, and the Yampa Valley Regional Airport in Hayden. 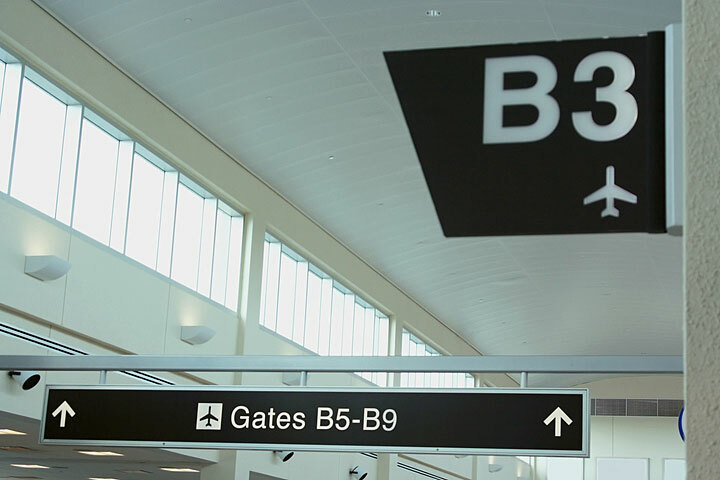 The photo at right shows departure gate signs at Denver International Airport. This Colorado airport map shows FAA-designated commercial service airports, reliever airports, and general aviation airports in the State of Colorado. Primary airports are designated with an airplane symbol. Colorado airport map source: FAA 2001-2005 NPIAS.